Forgetfulness is emerging as a tool of convenient politics. The Presidential Commission inquiry into the Central Bank Bond Scam saw then important Minister Ravi Karunanayake forget millions worth of payments for a Penthouse rent. The payment of millions by Perpetual Treasuries or its associated companies have made two ministers forgetful of how such monies came their way. We now have former President Mahinda Rajapaksa forgetful of an important telephone call from then Cabinet Minister Karu Jayasuriya, relating to the Keith Noyahr abduction. That was ten years ago – May 2008. Such absence of memory is understandable due to all the politics he has gone through since then, including his defeat in the last presidential election and return to parliamentary politics. However, there is also the strong possibility of such forgetfulness extending to so many other matters of his presidency, the cause of his defeat in the last presidential poll. Such memory blocks could help him escape thoughts about the extent of corruption during the near decade of his presidency. Yet, the current Presidential Commission probe into the activities of SriLankan Airways and Mihin Lanka, must certainly remind him of the appointment of his brother-in-law Nishantha Wickramasinghe as the Chairman of SriLankan, who clearly brought huge corruption to the National Carrier. Would he have also forgotten the funds of Siriliya Saviya, largely directed by his wife, and all the corrupt practices of his son Namal, which are now before the courts? Although Mahinda Rajapaksa may have forgotten the threat of near death faced by journalist Keith Noyahr, it is good for him to refresh his mind about it. Such memory refreshment (if needed) is also good about the killing of Lasantha Wickrematunga, the so-called fatal accident of rugby captain Wasim Thajudeen, and the abduction of Prageeth Eknaligoda. These are all matters of crime under the Rajapaksa regime, now before the courts. The public have certainly not forgotten these attacks on democracy and the right to life of the people. In addition, these matters would also involve memories of other members of the Rajapaksa family, who held high office and wielded power in MR’s years of presidency. Political amnesia is certainly helpful to those seeking to avoid the reprisals from crooked politics. However, it cannot erase from the mind of the public contempt for those who directed such crimes and were closely involved in them. There is an overall delay in bringing these criminals to justice. The FCID, all investigative bodies, and the judiciary, should speedily bring all perpetrators of these crimes to deserving justice, with a revival of memories. Inform the public of all valid information about these crimes, and obstruction to the probes by the lingering forces of corruption. The move by the Joint Opposition (JO) to make Mahinda Rajapaksa a candidate in the next Presidential Poll, despite the restriction on the number of terms a person could be President of Sri Lanka, under the 19th Amendment, shows the divisions within the JO on the choice of its candidate. The main legal opinion on this has come from the JO’s Chairman, Prof. G. L. Peiris, a former Vice Chancellor of the University of Colombo, with his career in the academic field of law. The proposal is an attack on the 19th Amendment, which removed more than two-term period for the presidency, brought about by Mahinda Rajapaksa himself, through the 18th Amendment. What MR introduced with 18A was similar to what prevails in many African ‘democracies’, where the presidents serve for several terms going on for nearly three decades. It was MR’s move to be in office until his son Namal could take over, and continue the Rajapaksa Raja Vaasala. The 19A removed this. The argument now is that the restoration of the two-term limit for the presidency is a ‘prospective’ move related to the future, and has no ‘retrospective’ application – thereby enabling MR to contest again. The Supreme Court must decide on the matter. GL Peiris expects to take this before the District Court, which will refer it to the Supreme Court, due to restrictions on seeking the advice of the SC on such a matter. Dr. Nihal Jayawickrama, a learned academic in law who has been teaching abroad for many years, is supportive of this view. However, there are other legal opinions that strongly differ, such as Dr. Jayampathy Wickremaratne, whose speciality is Constitutional Law, and was engaged in drafting the 19A, and many other leading academics and practitioners of law. The 19A is the subject of considerable opposition by the JO, and political parties and groups opposed to changing the JR Jayewardene Constitution of 1978, which Chandrika Kumaratunga and Mahinda Rajapaksa, have been strongly opposed to in manifestos and other policy statements. GL Peiris has all these years, while in Chandrika’s and MR’s Cabinets opposed the JR Constitution. However, the present political move, including by sections of the Sangha, is to retain it, especially with regard to the Executive Presidency. Although MR has so far not expressed much support for the GL Peiris thinking, he is not likely to oppose it, if the Supreme Court decides the 19A term limit is not relevant, and the provisions in the 18A, of more than two terms is accepted. A path to the return of the “Maha Rajaneni”. This is certainly a major legal worry to the public – more than 6 million (51.28%) who voted to defeat MR in January 2015, with the reduction of the terms of the presidency being a key slogan of the campaign. The JO will certainly have to seek proper legal opinion or a SC ruling with speed, because delays that could lead to a loss of its goal, will adversely affect its campaign for the coming presidential poll. It will resume the infighting within the Rajapaksa Family on the candidacy of Gotabhaya or Basil, with MR’s related concerns for the future of Namal. 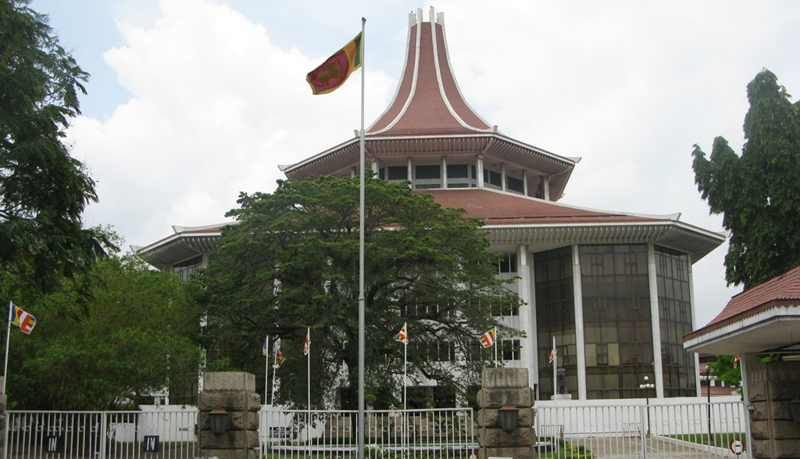 The Supreme Court had to decide recently on the opinion sought by President Maithripala Sirisena, on his ability to remain President for six years, and not five years as said in the 19A. He thought that being elected before the 19A was adopted in May 2015; his term of office would be six years as earlier. The SC held that his term was limited to five years, under 19A. A possible thinking on the ‘retrospective’ possibilities suggested for MR’s continued candidacy. A government clearly divided over many issues affecting the public has recently overcome two major issues – the threatened strikes by the Railway employees, and bus drivers and operators. The public reaction to the very badly timed Railway strike, and the lack of support within the bus services to the threatened bus strike, would have contributed to this. The government should look into the possibilities of closer association with the public, to bring about better understanding on issues manipulated by anti-government forces, leading to strikes. The Commission to Review Public sector Salaries, to recommend optimal salary structures for the State Sector, devoid of salary anomalies, is a major step forward to bring about a more efficient and functional public service. The recent statement by Finance and Media Minister Mangala Samaraweera calling for a total halt to recruitment in the public sector is an important proposal that requires proper follow up. It is certainly not a politically successful proposal. However, it is the responsibility of a government to think beyond immediate popularity, and the wider and future interests of society. For the past several decades, every government, Green, Blue or of combined colours, have been packing the public sector – departments, corporations and other organisations, with political supporters, with no concern for the success of the institutions. As the Daily News editorial in Thursday (23) quoted Minister Samaraweera, “there are 3,000 workers in a government office when the requirement is only for 1,000; there indeed is something badly wrong somewhere, which calls for immediate remedial action. No doubt, this situation is brought about by the fact that both major parties are today sharing power. If, prior to this, only the winning party stuffed state bodies with their supporters, we now have public sector institutions having to take the combined weight of unproductive labour at the cost of the tax payer, although UNP MPs bemoan that they are yet unable to get jobs for their supporters even though it was the Greens who were at the levers of power”. This is certainly an expose of the harsh reality of the public sector. Even in the final year of the Coalition of Unity, with its known differences, this calls for action to have a functional and efficient public sector in this country, which is manageable with its economy. It also calls for serious study of educational patterns in the country, which will help trained and trainable youth, to a society and economy that will soon face the realities of the Digital Revolution. This is a challenge that is both political and overly national, calling for strong commitment by government and the private sector.